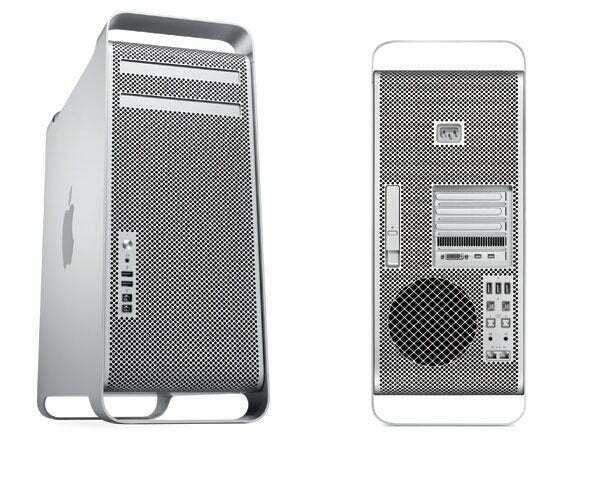 The days of this Mac Pro tower design are numbered. 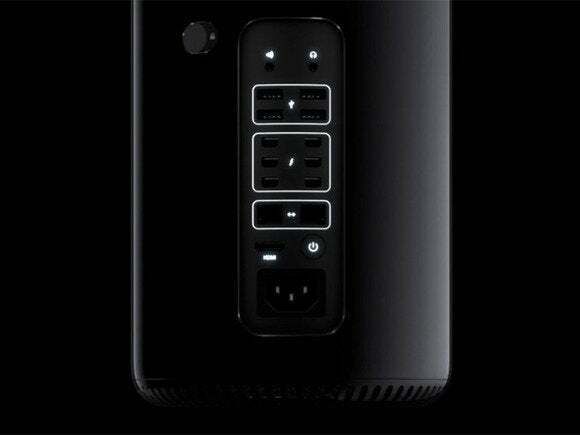 But the new high-end Mac will be a severe departure from what most Mac users think of when they think “Mac Pro.” It’s not the hulking beast of a machine that we’re all familiar with, but a model of compactness. The main concern about the new Mac Pro is its lack of internal expansion and customization options. Instead of having four internal hard drive bays, it will use built-in flash storage; additional drives will need to be connected externally. 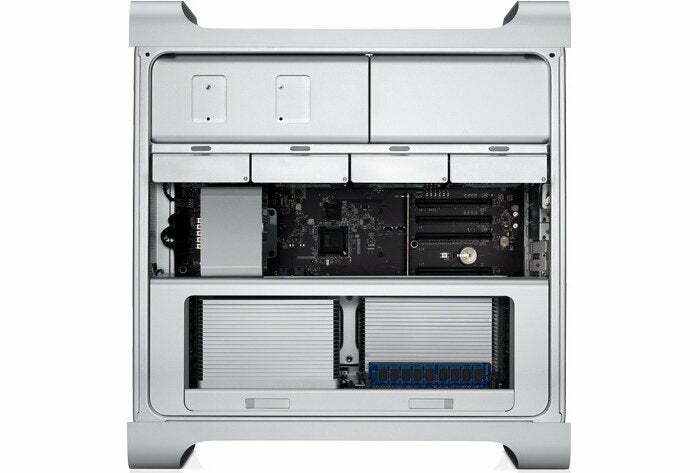 Same with PCI cards: An external expansion chassis, connected via Thunderbolt 2, will be required to house and connect the cards that many users have invested in heavily. The new 2013 Mac Pro comes with six Thunderbolt 2 ports to connect external storage devices and PCI expansion cards that are housed in an external chassis. So if you are invested in the Mac Pro line, you have a tough decision to make. Wait for the new Mac Pro and buy it along with the expansion chassis and external drives that you'll need to make it comparable to the old model? Or stick it out with your current towers, making do with those outdated technologies for a few years more? Ah, but there is a third option, one that gives you up-to-date technology and competitive performance, at a cost that's considerably less than the 2012 Mac Pro: Build your own computer, using off-the-shelf PC hardware, that runs Mac OS X. But for one very, very big reason, we can't recommend that path: It violates the OS X end-user license agreement. 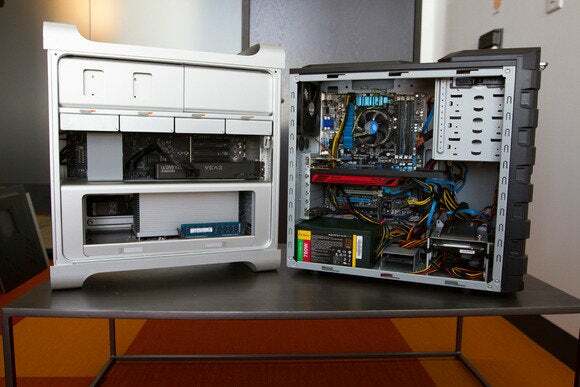 Still, out of purely academic interest, we in the Macworld Lab set out to discover how hard it is to build that kind of forbidden machine and see how it would compare with the current models. This isn’t the first time Macworld has done so; back in 2008, Rob Griffiths pieced a system together that he dubbed Frankenmac. So it seemed appropriate to call this new machine the Bride of Frankenmac. Users of the Mac Pro love its ability to hold four drives and house PCI cards. What we found is that the process of building your own computer isn't for the average Mac user. It helped that we were able to call on folks like PCWorld Lab Manager Tony Leung, who has years of experience assembling PCs from scratch. We also took advantage of the many online forums devoted to this kind of activity. Resources like tonymacx86.com and InsanelyMac are very helpful, and the knowledgeable and supportive users of their forums offer help to anyone stuck during the process. Users in these forums have been able to create Haswell-based computers running Mavericks. Lifehacker.com is also a good resource, as it keeps an updated list of known working components and has a list of DIY resources. Inside the Bride of Frankenmac. If you don't have them sitting around your lab, such parts are available from resellers like Newegg.com for about $1100 total. That’s some $1000 less than the price of Apple’s entry-level 2012 Mac Pro, with its (old) 3.2GHz quad-core Intel Xeon processor, 6GB of RAM, 1TB hard drive, Superdrive, and ATI Radeon HD5770 graphics. To see how our illicit Bride compared with the currently shipping Mac Pro in performance, we turned to our system performance benchmarking suite, Speedmark 8. Our Portal 2 test was 22 percent faster on the Bride of Frankenmac, and Cinebench’s OpenGL test was 15 percent faster. When we upped the resolution on the Portal 2 test and maxed out the settings, the Bride of Frankenmac was 65 percent faster than the Mac Pro. We also swapped the graphics cards between the two systems to see how that would affect results. Our standard Portal 2 test results were the same, regardless of the card, which indicates that the GPU didn’t have a problem with the test and that the bottleneck was the CPU. When we cranked up the resolution and settings, we found that the results followed the card: The Nvidia card that originated in the Bride of Frankenmac was much faster than the ATI card that is standard with the $2499 Mac Pro, regardless of what system it was installed in. The Cinebench OpenGL test was a bit faster on the ATI card than the Nvidia, but both cards were faster in this test when installed in the Bride of Frankenmac than when installed on the Mac Pro. The Bride of Frankenmac (right) isn't much of a looker, but its performance makes up for its appearance. We then compared our creation to a high-end 12-core Mac Pro—the $3799 version with two 2.4GHz 6-core Intel Xeon processors, 12GB of RAM, and the same 1TB hard drive and ATI Radeon card as the $2499 Mac Pro. Once again the Bride came out on top; it was 14 percent faster overall than the Mac Pro. At least this time the Mac Pro was faster in a few tests, mainly those that can take advantage of the 12 processing cores found in the $3799 Mac Pro. Mathematicamark 7, for example, was 25 percent faster on the Mac Pro than on the Bride of Frankenmac. Cinebench’s OpenGL test was 41 percent faster on the Mac Pro, while file unzipping and iMovie importing were both 6 percent faster on the Mac Pro. Getting to all that speedy performance wasn't simple. For example, the ATI card didn’t work right away. The system would start up but couldn't get past the BIOS. It turned out that the bootloader we used didn't support this particular video card. We were able to find a solution online, but it wasn't elegant: It required booting onto a USB stick with a different bootloader installed. Once we booted from the USB drive, the system would start up, but the screen would go black. Hitting the power button twice (once to put the system to sleep and then again to wake up the system) would bring the screen back to life. The same trick was required each time we rebooted. Such quirks can hit other DIY systems, as a couple of colleagues in our video department have found. One could not get the motherboard audio to work and finally purchased a USB audio adapter. He also had problems getting two monitors to work—he had to shut down and flip the rear power switch off and unplug the power cord from the wall, and then plug everything back in and start back up in order to see both displays. Another colleague's system would intermittently unmount FireWire drives, and his rear USB ports don't work at all. Getting Blackmagic Design’s Intensity Pro video editing card to work in the Bride of Frankenmac did not require any of the workarounds necessary for the ATI card. That’s something of note for current Mac Pro users with PCI cards who want to continue using such cards inside a computer case instead of externally in a Thunderbolt expansion chassis with the upcoming Mac Pro. It lives: The Bride of Frakenmac was made using parts in our lab. It’s worth mentioning that, unlike an Apple-built computer, our Bride of Frankenmac is not covered by an umbrella warranty. If the power supply conks out, we’ll need to take that up with Antec. The same goes for all of the components. If anything breaks or stops working, it'll be up to us to deal with the individual component manufacturers. Future OS X updates could also prove problematic to our custom setup. Apple, of course, does copious amounts of internal testing to make sure that software updates don’t cause problems with its systems, but it could never test (or want to test) each update against every possible combination of components, especially components the company doesn’t officially support. If you were to go down this unsanctioned path, whenever Apple released an OS update, you'd want to wait a few days before upgrading, then spend some time monitoring the forums to see if other folks are running into problems with their custom systems. Next page: Complete test results. Editor's note: Updated at 4 p.m. PT to rectify a case design error regarding the 2013 Mac Pro and added video. Updated on 9/11/13 to correct the graphics card identified in the Bride of Frankenmac.